aSurvival rate calculated from data in the publication. bResults calculated from data in the publication. cSee Ref. 47 and Table 6.
dNo significant difference in disease-free survival rate between open and laparoscopic groups (P = 0.6775). Abbreviations: Lap, laparoscopic nephroureterectomy; Open, open nephroureterectomy; RFS, recurrence-free survival. Source: Modified from Ref. 28. FIGURE3 ■ Stage dependent disease-specific survival after nephroureterectomy for upper tract transitional cell carcinoma. Source: From Ref. 2.
have a propensity for local implantation (50,51). 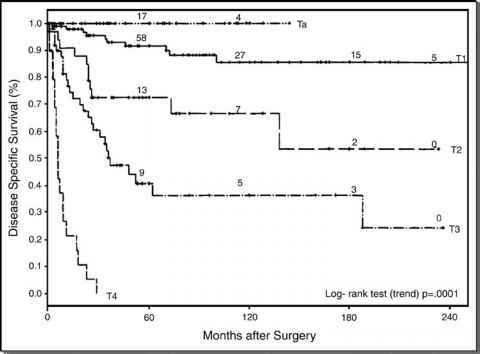 There have been seven reported cases of port site recurrence of transitional cell carcinoma, only three of which occurred during laparoscopic radical nephroureterectomy for suspected transitional cell carcinoma (Table 6) (47,56-58). Of the remaining four, two occurred during laparoscopic pelvic lymph node dissection (59,60), one after laparoscopic biopsy of bladder transitional cell carcinoma (51), and one after nephrectomy for tuberculous kidney harboring unsuspected transitional cell carcinoma (58). The three cases of port site metastasis during laparoscopic radical nephroureterectomy represent less than 1% of all reported cases of laparoscopic radical nephroureterectomy (14-16,18,20,21,24, 26,27,29,44). Less recognized but possibly more clinically significant is disseminated recurrences after endoscopic excision of the distal ureter and bladder cuff, procedures that predate laparoscopic techniques (52-55). Recurrences after transurethral resection of the ureteral orifice are the most frequently reported. 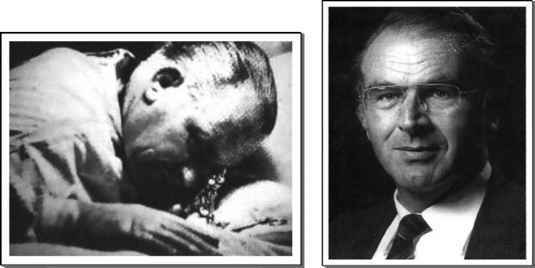 This procedure may be associated with irrigant extravasation, urine spillage from the upper urinary tract into the extraperitoneal space despite attempted "sealing" by fulguration (which is unlikely to provide effective sealing), and residual discontinuous segments of the distal ureter. All these events increase the risk of extravesical tumor recurrence, resulting in iatrogenic T3-4 disease that may not be seen cystoscopically or radiographically (51). At particular risk are patients whose upper urinary tract has not been completely evaluated: an occult distal ureteral tumor or ureteral carcinoma in situ may be present in addition to an obvious renal pelvic tumor. carcinoma in situ of the ureter may not be visible endoscopically or radiographically. Also, patients with distal or intramural ureteral tumors are poor candidates for any form of endoscopic resection of the distal ureter (13,14); in particular, those with possible invasive distal ureteral tumors are best served by an open trans-vesical technique (Table 3). The outcome in these cases is often grave, the clinical experience is limited, and the optimal choice of therapy is unclear (Table 6). In the absence of distant disease, wide surgical excision appears to offer a chance at a disease-free interval. Radiation therapy for pelvic extravesical disease occurring at the endoscopic site appears to be uniformly followed by death, although local palliation may be provided. In the presence of additional distant disease, an initial trial of up-front systemic therapy may be most preferable, with additional therapy rendered depending on the response to therapy. aNone of the specimens in these cases were morcellated. Presumably open method; ureteral stent placed after ureteroscopy 1 wk previously was seen protruding from the ureter during surgery. Abbreviations: DOD, died of disease; NED, no evidence of disease; TUR, transurethral resection.